Proprietary Name: Activice What is the Proprietary Name? Non-Proprietary Name: Menthol What is the Non-Proprietary Name? Activice with NDC 53329-991 is a a human over the counter drug product labeled by Medline Industries. 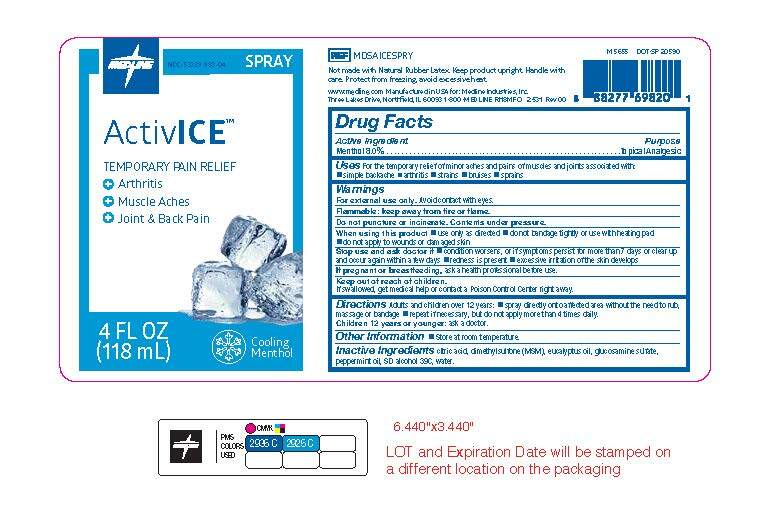 The generic name of Activice is menthol. The product's dosage form is spray and is administered via topical form. For external use only.Avoid contact with eyes.Flammable: keep away from fire or flame.Do not puncture or incinerate. Contents under pressure. If swallowed, get medical helop or contact a Poison Control Center right away. Adults and children over 12 years:spray directly onto affected area without the need to rub, massage or bandagerepeat if necessary, but do not apply more than 4 times daily.Children 12 years or younger: ask a doctor. Citric acid, dimethylsulfone (MSM), eucalyptus oil, glucosamine sulfate, peppermint oil, SD alcohol 39C, water.